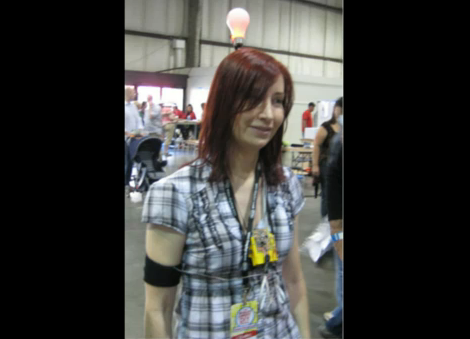 [Jeri Ellsworth] had a bright idea – a brain-activated light bulb that floats above your head. While out and about, she saw some guy with a video game icon attached to metal rod sticking out of his backpack. The rod made the icon appear to be floating above his head (think The Sims), which was the inspiration for this LED powered light bulb. The bulb is connected to a metal rod, as well as a metal hoop which is springy enough to keep a pair of electrodes snugly attached to your head. Those electrodes, along with a third probe used for noise reference, are hooked up to a AD620 instrumentation amplifier. With the help of op amps, it modulates the red or green LEDs that are attached to the back side of the light bulb. The end result is an amusing way to show brain activity while being grilled on a Q/A panel, or while just wandering around taking in all the amazing sights presented at Maker Faire. Join us after the break for a video demonstration. 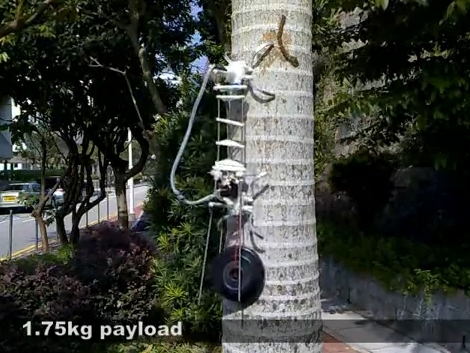 Sharp talons and a strong torso let this robot climb trees, even while carrying a heavy payload. 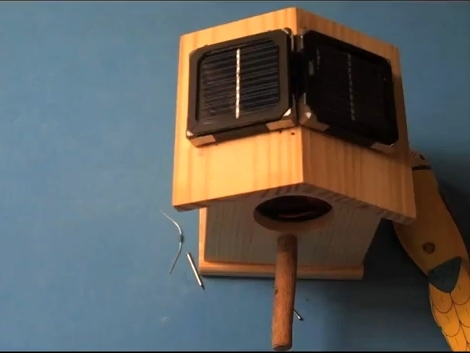 It uses a simple principle, two gripping units allow it to grab onto the tree. These modules alternate, one grips while the torso moves the other up the tree. You can make out the trio of rods which connect the front and back half of the robot in the image above. Watch the video after the break to see how the motors move these rods with the dexterity of an inchworm, allowing it not only to climb upwards, but to bend and flex to match the contours encountered in the wild. This was presented at International Conference on Robotics and Automation a few weeks ago. Unfortunately we can only find an abstract for the paper so please leave a link in the comments if you know where to find the full monty. While not necessarily an easy thing to learn, the ability to reverse engineer embedded device firmware is an incredibly useful skill. Reverse engineering firmware allows you to analyze a device for bugs and vulnerabilities, as well as gives you the opportunity to add features if you happen to be so inclined. When it comes to things such as jailbroken iPhones, Android phones, and Nooks, you can guarantee that a close look at the firmware helped to move the process along. [Craig] works with embedded systems quite frequently and put together a detailed walkthrough demonstrating how he reverse engineers device firmware. The subject of his hacking was a new firmware package he obtained for a Linksys WWAG120 Wireless-N router. His tutorial walks through some of the most common reverse engineering methods and tools, which allow him to slowly unravel the firmware’s secrets. When finished, he had a working copy of the router’s boot loader, kernel, and file system – all ready to be further analyzed. His writeup includes tons of additional details, so be sure to swing by his site if reverse engineering is something you are interested in. Students at Dutch TU Delft university recently built a huge replica of the original NES controller (Google Translation), which is fully functional and can be used to play games on a large display screen they also installed. How big is it, you ask? It’s about 6 meters wide – over 30 times the size of the original NES game pad and requires participants to jump on the buttons to play. Members of [Forskningsavdelningen], a Swedish hackerspace, are working on software that will allow users to vectorize bitmap images in order to convert them to G-code files for CNC milling. A good portion of the project is complete, but there is still a bit of work to do, so you won’t see it in action for a while. When it’s ready, we’ll be sure to let you know. If you forked out big bucks for the special edition of Dead Space 2, you know how lame the included plasma cutter replica is. Check out this video, that shows you how to convert your LED toy to a dual laser, fire starting, laser pistol. The process is pretty simple, so what are you waiting for? [Jonathan] wrote in to share a project he and some friends have just finished. He’s not sharing a ton of details at the moment, but he has put up a video showing off their wireless LED juggling balls. All we know is that they use bright RGB LEDS, Zigbees for communication, and that they are awesome. We can’t wait to hear more about them! [Pirate] recently unveiled his latest work, a water-cooled Playstation 3 laptop. It looks pretty sharp, and can undoubtedly rival some of Ben Heck’s work, even if it does have an external PSU. Obviously having a separate power component isn’t necessarily ideal, but when you are cramming all of that water cooling goodness into such a small package, something has to give!